In many cities, there is an interesting old hotel, something to remind you of the days when travel meant long journeys by rail or sea, a place where the rich and the famous of its day would stay. Nearly all of these were built before the Second World War, and many date back to Queen Victoria's reign. Many of these hotels have hosted world celebrities of the 19th and 20th centuries, and some are mentioned in classical works of fiction. Staying in such places is usually not cheap, though more modern high-end hotels might be even costlier. Nor are they necessarily the most luxurious option; the modern high-end places may be even better. However, the grand old hotels are usually very central and they do have an appeal all their own; the old fashioned fittings, the lack of the latest amenities and a certain graceful agedness are often part of their character. Of course, you need not stay in such hotels to enjoy some of their services. 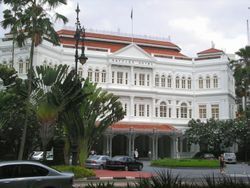 For example, a visitor to Singapore might just go to Raffles for a Singapore Sling at the Long Bar where Rudyard Kipling and Noel Coward once drank, and check out the Billiard Room where Singapore's last tiger was shot. A traveler with piles of money might consider a round the world flight staying in many of these hotels. 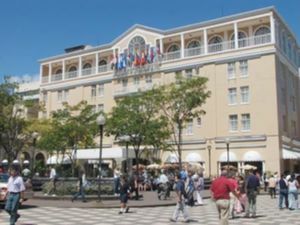 As many Grand old hotels were built in the late 19th century to complement the railroads or the steamer docks, they might be close to, but not inside, an Old Town. Luxor, Egypt - Old Winter Palace  The discovery of Tutankhamen's tomb was first announced on their bulletin board. Kolkata, India - The Great Eastern Hotel. Once known as 'the jewel of the east' the hotel is sadly dilapidated these days. Many Swedish towns have a town hotel, stadshotell, colloquially Statt, usually built with the advent of rail traffic in the late 19th century. This hotel is usually the most prominent historical building, second to the church or the city hall, and the city's nightlife hotspot. The rating is usually proportional to the town's size, at three stars in small towns, reaching five stars only in major cities. There is a program called [Historic Hotels of America] with 200-odd hotels involved. The grand old hotels in Canada have a unique place in Canadian history. Most of them were built during first quarter of the 20th century by the Canadian Pacific Railway, the Canadian National Railway, or Grand Trunk Railway in order to provide elegant accommodation while viewing the natural beauty along the rail line. Later, the railway sold them to international chains, mainly Fairmont. These hotels are popular with tourists and locals alike and though overnight stays are expensive, they represent a fine piece of Canadiana worth visiting even if you only have time for a walk through the lobby. Two - Banff and Lake Louise - are major tourist resorts in their own right, located amid stunning Rocky Mountain scenery. San José, Costa Rica The Hotel Grano de Oro , Grand old hotel of Victorian design. Also listed as a small, distinctive hotel. In the heart of San Jose by Sabana park and walking distance to the art museum. This travel topic is an outline and should either be merged into an appropriate parent topic or else developed further. It has a template, but there is not enough information present for it to be of real use. It was last edited on 2019-04-15 and will be merged or deleted if not modified for one year. Please plunge forward and rescue it!